Now that new credit card regulations protect you from some of the industry's trickiest practices, review your credit card use to identify areas that need improvement. Here are five good credit card habits to establish or keep. 1. Pay your credit card bills on time. Missing payments or paying your bill late costs you now and later. Credit card late fees run as high as $39, and penalty interest rates can double your monthly minimum payments. Even under the new credit card rules, credit card companies can hike your interest rate if you're more than 60 days late on a payment. Late payments, which stay on your credit reports for up to seven years, also hurt your credit score, which affects the interest rates you're offered on new credit. Your credit usage ratio--the amount of credit you use compared to your available credit--plays a role in your credit score. You appear over-extended if you use too much of your available credit, so experts recommend keeping your credit card balances low--no more than 30 percent of your credit card limits, even if you pay off your cards in full each month. 3. Monitor credit card statements closely. Keep your credit card receipts and compare them to your monthly statement to make sure all the charges are correct. This helps you detect any fraudulent charges and keep track of how much you're spending, an important step toward staying within a budget. Check your statement online at least once a week to catch any problems right away. 4. 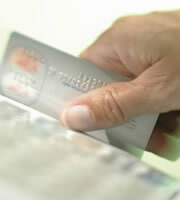 Maintain a reasonable number of credit cards. How many credit cards is too many? There is no definite answer, but financial experts say most consumers need no more than two or three cards. If you have so many accounts you have trouble keeping track of due dates, then you have too many credit cards. 5. Shop for the best credit card terms. Look for credit cards with the best interest rate if you carry a balance and a low or no annual fee. Read information about other terms, so you understand charges you'll incur for services, such as cash advances or balance transfers. And pay attention to notices your credit card companies send you. Issuers must give you 45 days notice and a chance to opt out of the account when proposing interest rate hikes on new purchases. 0 Responses to "5 Best Credit Card Habits"